Unfortunately, Botulism is the doom and gloom where Canning and Preserving Food are concerned. Now days, people are absolutely terrified of it. It’s to the point, they no longer Can or Preserve food the way Momma and Grandma did. Because of that, I thought it was important to write up a small “getting’ down to it” article on the subject. Something that might break it down for us all to understand without the complicated- bigger- than- life- definitions. So what in the heck is it? Botulism is a deadly type of food poisoning. It comes from a bacterium called Clostridium Botulinum. There’s no secret conspiracy where Botulism is concerned. It wasn’t born in a lab by some whacked out Scientist. It happens to live in the soil where all of our gardens grow. That means, it gets on your vegetables but not in any amount that can be considered harmful. Meaning, we have to do a little somethin’ somethin’ to make it that way. Now hold up. I’m going to stress that, because if you’re like me, you have walked out there a million times, grabbed a green bean or cucumber or two and have made a snack right there in the middle of your mater patch. Chomped down without a care in the world. Knowing what I know about Botulism, I’ll still be doing that. So again, what’s already out there in the soil isn’t worth calling 911 over. So “when” does “what’s in the soil” become a problem? It’s only a concern when food is Canned or Preserved wrong. Foods that undergo a vacuum effect (the sealing process) but do not have the acid levels needed for safe preserving, are said to be the breeding ground for bacterium to grow. That’s why “Grandma’s Way” — the Water Bath Canner way— shouldn’t be “Our Way” when it comes to certain types of Canning . . . or so the warnings go. So how do we make it safe? Basically, Acid is your Superman. Sealing a Jar without a Superhero (Acid) inside, means the villain (Botulism) gets to run amuck and spawn forth-deadly weapons. Put Superman (Acid) in there, and the villain (Botulism), doesn’t have a chance in hell. If you don’t have a superhero (acid) to stick in the jar, then you have to rely on Heat. High heat temperatures can be Superman’s backup plan. What do you mean, Heat? Here begins a truly sensitive subject and debate . . . I bet there is one going on at a forum near you. This is where things can get a bit sensitive here— as far as the debate goes— because people like our Grandmothers, Great Grandmothers and so on, used to Can Green Beans and Tomatoes, religiously, with a Water Bath Canner. All of which, never killed a soul sitting at their table. All of which, would laugh at our present day fears of the horrid ol’ Botulism! So what’s the big deal then? To each his own, right? I personally, believe, that may be the reason my Grandma never killed any of us off. She used to have her Green Bean packed jars boiling in that Water Bath Canner for a good 3 and a half hours or so. That’s ONLY my theory, and in no way can I argue or prove that. Still, all this talk about Acid, are you thinking what I’m thinking? Why wouldn’t tomatoes apply since they are high in Acid? I say they don’t apply as the Green Beans do, but judging by the opinions of some on the internet, people claim they do since we have so many new species of tomatoes now. Not all are highly acidic, they say. So let’s recap — How do we avoid the big, bad Villain Botulism? Kill it? What do we do!!!???? In order to avoid Botulism, food needs to become hot enough to kill off any and all molds, yeasts or bacteria present. Again, without Acid, the bacterium has a field day once the vacuum effect happens. There is nothing inside to battle it. No Superhero. If there is no Acid, we need Heat and in order to get the Heat you need, experts say, use a Pressure Canner. What are low acid foods, then? Any vegetable, meat, fish, seafood, soup, stew. Any kind of resembling mixture. Anything that has vinegar is okay. Pickles — anything pickled can Water Bath to its heart’s content. 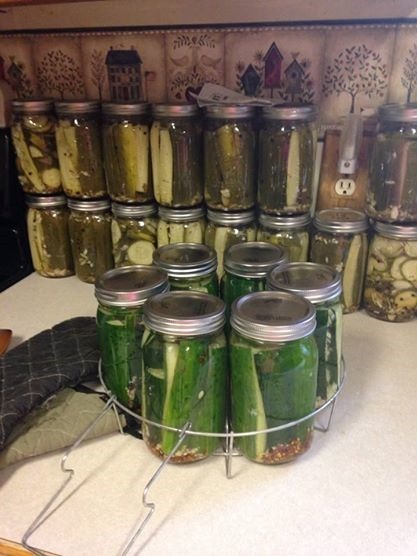 If you are paranoid about the acid levels and whether or not what you’re Canning has enough, don’t freak out. You can easily test it by buying PH strips. If the reading is below 4.0, then you have enough Acid. Bacteria starts to die off between 165 degrees F and 240. It’s as good as dead at 240. A Pressure Canner can take you to 240 and beyond. Tagged: Botulism, Canning and Preserving Food, Causes, Lethal Food Poisoning, The Crowin' Hen, What is it? Previous Post Free Range, Tractors, or Coop?